ThirtyFifty has a diary of wine tasting events that you can attend in Liverpool, located in the city centre at the Jurys Inn Hotel at Kings Waterfront, a 10 minute walk from Liverpool Central train station. We have regular Evening Wine Tastings that you can attend mid-week on a Tuesday or Wednesday evening. The tastings are good fun as well as educational and great value for money too. More dates will be added during the year as the dates get booked up. We can also host our wine tastings for private groups or corporate wine tastings at various other venues in Liverpool. 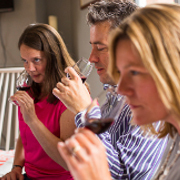 Our evening Liverpool wine tastings are both refreshing and fun, but also easy for novice wine drinkers to get a real solid grounding that will help navigate the world of wine with confidence. The wines are accompanied by a selection of savoury canapés. Within easy reach of Liverpool is our Cheshire based One Day Wine Course. You can attend as an all day Saturday course for £89 or stay to make an all inclusive Weekend Wine Tasting Breaks. Join us for a brilliant day out, tasting 16 wines and a fantastic 3 course lunch. All our One Day Wine Courses are run on Saturdays, starting at 10.30am and finishing at 4.00pm. Numbers are restricted to a maximum of 18 so there is plenty of opportunity to get to know other attendees and ask questions. The tasting is perfectly pitched at enthusiastic amateurs, so novices, as well as those with a bit more knowledge, will enjoy and get plenty out of the day. Not found what you are looking for? Register your interest in attending a wine tasting event in Liverpool by completing the form below.